Gianluigi Donnarumma, worldwide teen sensation and current AC Milan goalkeeper, has been among the top interests of world football since the previous year, and latest talks from his super agent Mino Raiola have raised more than a few eyebrows among many clubs, especially in England’s top league. According to reports, Raiola has demanded £165,000 a week for his player, and it remains to be seen if AC Milan will be willing to meet his demands. Raiola is currently negotiating a new deal for his keeper at the club, but the wages area might be a problem, as Milan are currently being taken over by a Chinese investor, and only once the procedure is complete can Raiola discuss further details and deals. With demands of wages being sky high, and with a time value of 4 years being asked for, Milan are unlikely to agree such conditions, and hence bring many interested Premier League clubs into the picture. Juventus are a team interested in the lad as they search for a long term and worthy replacement once Buffon exits the club, but if the player is willing to step out of the Serie A, two English giants, viz. Manchester United and Chelsea, are keen to bring the player into their squads. Termed as “the new Buffon”, Donnarumma is highly unlikely to move to a club where he will not get guaranteed first team football, and hence, with Courtois and De Gea, the English clubs might be a less likely target for him. 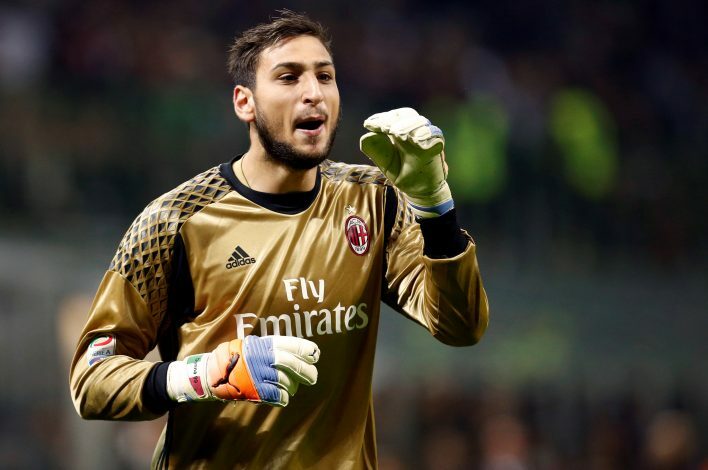 Donnarumma has started 49 games for AC Milan since his debut, and made 2 international appearances for Italy.